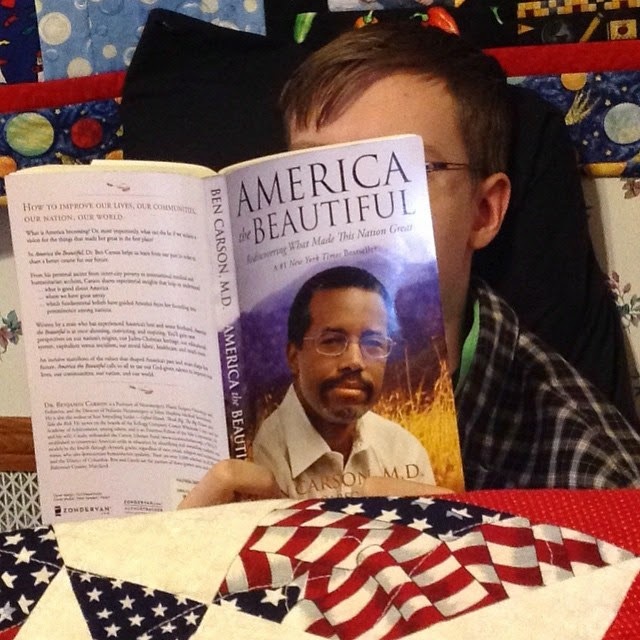 My oldest son discovered that he really likes what Ben Carson has to say, so when I had the opportunity to review a book of his through Family Christian, I had to jump at it. America the Beautiful did not disappoint. Connor grabbed it immediately and started reading. He proceeded to come to me pretty much every time he picked up the book and say something like, "Mom, listen to this. It makes so much sense!" One thing he said to me was that this is "not a book to sit down and just read through in an afternoon as it requires a lot of thought." He did take it slowly, reading a chapter or even less in a sitting. This child takes after his mama, and he can easily read almost anything in a single sitting. Except, perhaps, his homework. But that's another post. What is America becoming? Or, more importantly, what can she be if we reclaim a vision for the things that made her great in the first place? In America the Beautiful: Rediscovering What Made This Nation Great, Dr. Ben Carson, author and professor at John Hopkins Medical Institutions, helps us learn from our past in order to chart a better course for our future. From his personal ascent from inner-city poverty to international medical and humanitarian acclaim, Carson shares experiential insights that help us understand what is good about America, where we have gone astray and which fundamental beliefs have guided America from her founding into preeminence among nations. Written by a man who has experienced America's best and worst firsthand, America the Beautiful is at once alarming, convicting and inspiring. You'll gain new perspectives on our nation's origins, our Judeo-Christian heritage, our educational system, capitalism versus socialism, our moral fabric, healthcare and much more. An incisive manifesto on the values that shaped America's past and must shape her future, America the Beautiful calls us all to use our God-given talents to improve our lives, our communities, our nation and our world. Dr. Carson goes through each of the ideas listed in that second paragraph and he gives a whole lot of historical background to the issue and presents his ideas as well. "He presents a problem and lets you think about it, and then presents his solutions. He keeps you involved." was how Connor described it. Connor has finished reading the book. I have not yet. I've heard about most of it though. What I have read is written in a conversational style, with lots of examples from all kinds of different people. I completely agree with my son that Carson is engaging and encouraging. One message that Connor appreciated was summed up in this quote from Benjamin Franklin, which is included in the notes. "The U.S. Constitution doesn't guarantee happiness, only the pursuit of it. You have to catch up with it yourself." Another statement he liked, which Carson brought up more than once, was "If two people believe the same thing about everything, one of them isn't necessary." One of the best things about this book is that it goes over so many of the issues that are so very important in the United States today, and it gets you thinking about them. Especially as we are going into a presidential campaign again (didn't we just finish one? ), there is plenty of food for thought, and we do have room to disagree with Carson. However, as Connor put it, "I think that this book should be required for everyone voting for the first time as it is making you aware of what the issues out there really are." I have a copy to give away! With a bonus entry if you have a first-time presidential voter in your midst. I'm doing that for Connor, and I obviously have no way to check that, so I'm trusting you on that one! 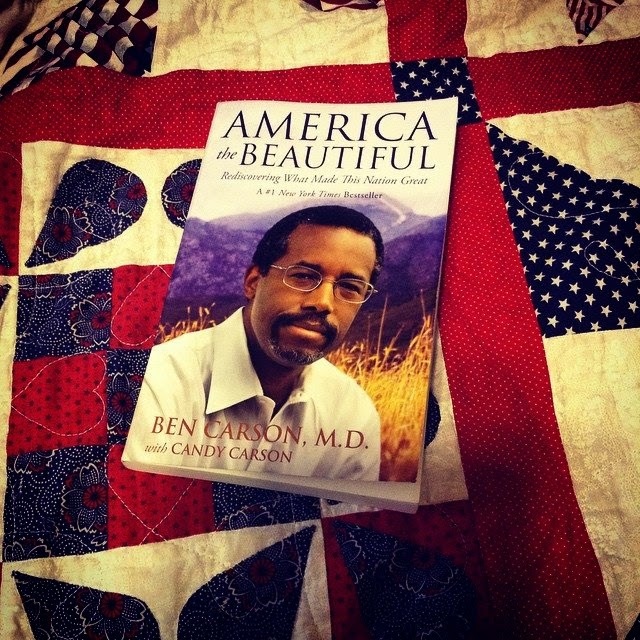 I really enjoyed reading Ben Carson's biography. I would love to read this book too! It sounds great. This book looks really awesome! I have liked Ben Carson since I first saw him on the What My Parents Did Right series decades ago. I would love to read this. I'm interested in finding out more about Ben Carson and this is such a timely topic.